The beeps and alarms emitted by patient monitors make up the background noise at every hospital. The trend in the market, however, is an effort to reduce those sounds, weeding out the false alerts and helping facilities get out from under the crushing avalanche of alarm fatigue. Companies are also integrating their patient monitoring products with hospital EMRs, going wireless and inching forward to the next frontier — in-home monitoring, in an effort to decrease readmission rates. Here’s what’s new from several of the top patient monitor manufacturers. EarlySense manufactures a contact-free patient monitor and analytics platform, with a sensor that goes under the mattress and provides continuous vital sign and motion information. “With the contactless sensor, there is no issue with the sensor falling off,” says Avner Halperin, EarlySense’s chief executive officer. At the end of 2016, the company launched the InSight, a lighter version of its Early-Sense system without a monitor at the bedside. The system also reports on alert response times and has advanced algorithms for reducing false alarms. The company also recently introduced the product EarlySense LIVE for the home, which provides full cardiac and respiratory sensing as well as sleep analysis. While the product is only available for the consumer market, Halperin notes that in the future, hospitals will deploy similar technology to reduce readmission rates. 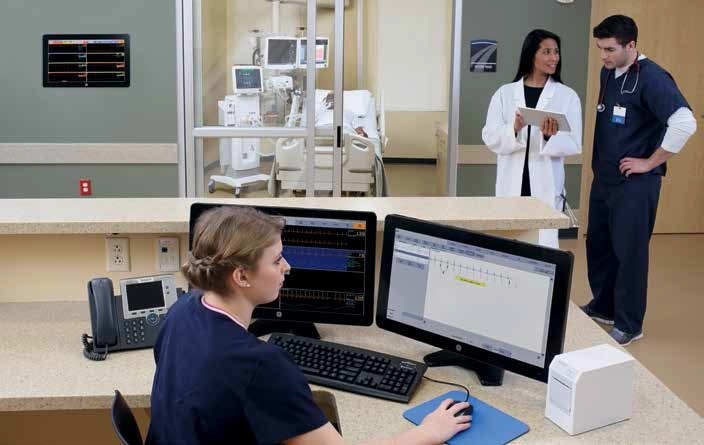 At HIMSS in 2016, GE Healthcare launched Alarm Spotlight, an analytics application that allows clinicians to tailor the threshold for alarms, visualizing alarm burden by day and by type of alarm, with the goal of reducing alarm fatigue.